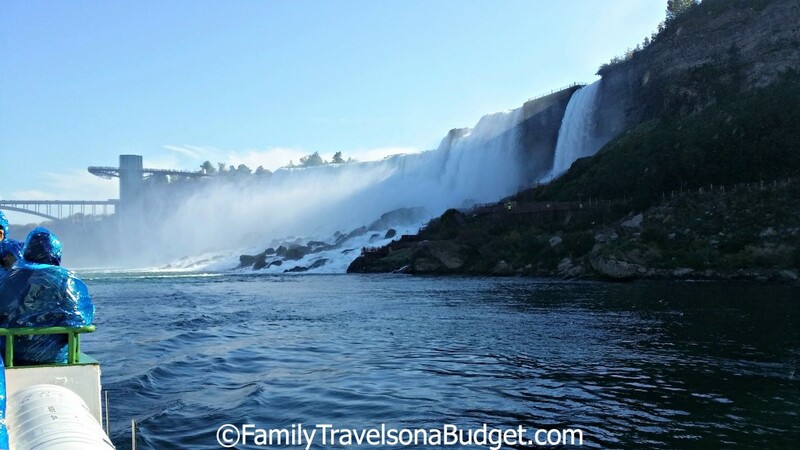 We received complimentary Niagara USA Discovery Passes to facilitate this review. All opinions are uniquely ours. The Maid of the Mist, a Niagara Falls attraction for more than 150 years, takes riders past the American Falls into the basin of the Horseshoe Falls. Guests get close to the falls, and get drenched by the mist. They hear and feel the sheer power of the falling water — something not to miss! In all, from ticketing to completion, this attraction takes a little less than one hour. The night before our ride, as I tucked Ellie into her bed at The Giacomo Hotel, she grinned. “Tomorrow we ride in the Falls, Mommy.” Ohhhh, I hoped it would live up to her expectations. After breakfast the next morning, we walked from the hotel to the Maid of the Mist — and easy .5 mile stroll through Niagara Falls State Park to the ticket window. We got our tickets and walked up the ramp to the ride’s access elevator. Ellie’s eyes grew large as she got her first up-close site of the falls. Her grin grew large. 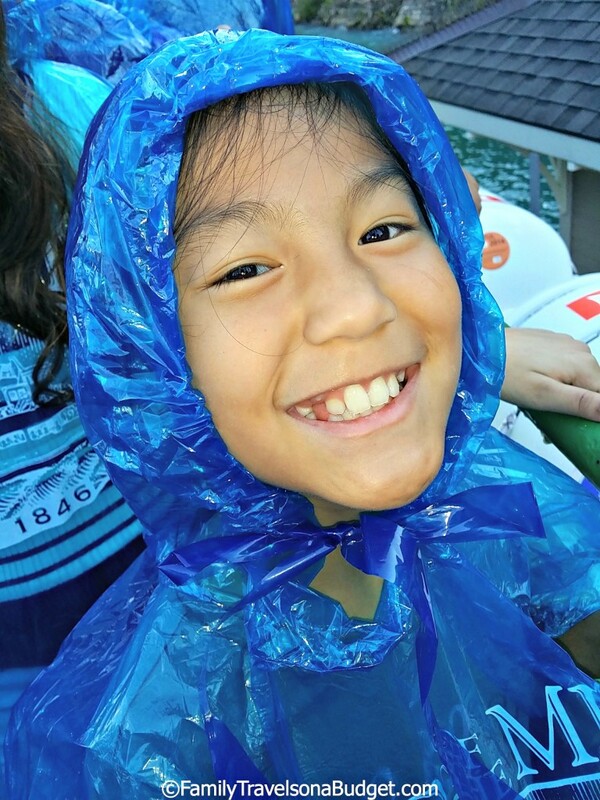 We got our blue ponchos (“free” souvenirs) and boarded the boat which really hasn’t changed since my childhood. We claimed one of the last available railing spots along the side of the boat and held on as we rode along. As we approached the American Falls, the mist was everywhere. People jostled us to get pictures. Groups pushed and shoved to get “selfies” with the mist behind them. Ellie, thankfully, was fairly oblivious to the pushing going on, perhaps because I shielded her from it. Her face was wet — and she laughed at my wet glasses. We passed out of the mist and enjoyed looking at the birds, the falls in the distance and the wall of rock all around. We approached the Canadian Horseshoe Falls and most riders ran to the far side of the boat to take more selfies. I pulled out my phone to get a couple shots of Ellie and me, but honestly, it was so wet we pretty much gave up. My phone was also my GPS, so I couldn’t let it get drenched! Instead, we spent our time looking for rainbows in the mist and waving to the people looking down from the park. The return trip was much less wet, and we enjoyed watching the birds and the warm sun on our faces. Afterward, we climbed the stairs to get a close-up look at the American Falls and some great photos of rainbows (without the mist in our faces. YAY!). We also enjoyed the views from the Observation Deck. Even though the Observation Deck was crowded, everyone was really friendly, and groups took turns photographing each other with the falls in the background. This is the best place to get photos of the falls! I expected Maid of the Mist to be a highlight of our trip, but it did not live up to my childhood memories (maybe that’s typical). Perhaps, the groups on our ride affected my ability to enjoy it — but I was afraid they’d push Ellie into the railing or knock her down. The actual view of the falls was amazing! Also, hearing the noise from so close really gave a strong impression of the water’s power falling from above. The Observation Deck was my favorite part of this experience. It was fun to look at the falls from a safe, dry place and get some photos. Don’t expect to get good photos while on the Maid of the Mist. Instead, enjoy the ride and the views and save your camera! Take photos before you board — or after boarding while waiting for the ride to start. After the ride, get up close photos from the stairs that take you to the American Falls or from the Observation Deck. I cringed at seeing DSLRs getting drenched… but maybe that’s just me? Don’t wear flip-flops! Water literally sloshes across the deck and your feet will be covered in water. One person lost a flip-flop over the side of the deck on our excursion. Who knew? This attraction is suitable for all ages, but plan on holding younger kids when the floor gets really wet. 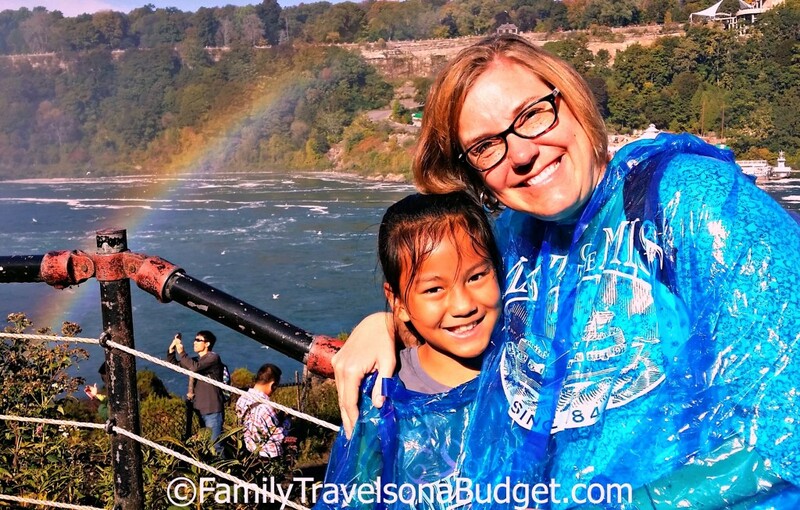 Ellie and I were fortunate to have warm temperatures when we rode the Maid of the Mist. The sun’s warm rays quickly dried our clothes and hair afterward. If you go on a cold day, use a warm raincoat and rain boots (feet get wet). 1. Make sure you go on the top deck where you get really wet. 2. 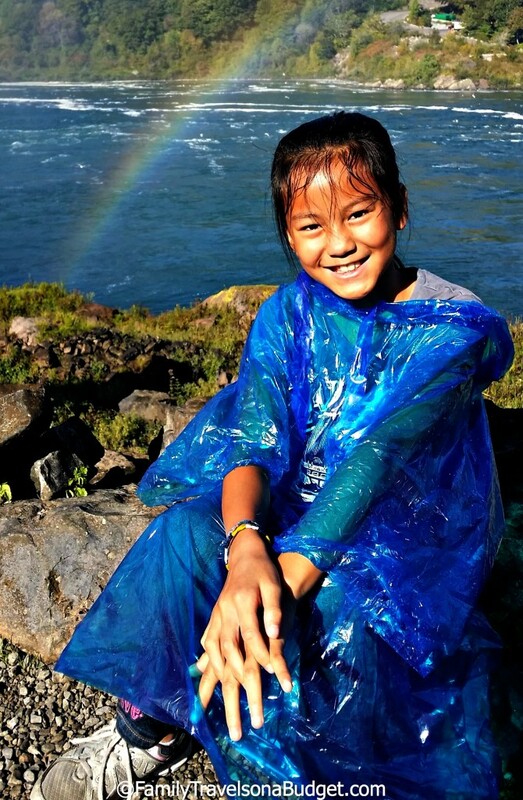 After your ride, climb the stairs over by the American Falls so you can see all the rainbows. 3. On the Observation Deck, you get the best pictures. Allow about 1 hour for this attraction from parking lot to finish. The ride itself is 20 minutes, and during peak times, you might wait for a while to get a boat. The extra time allows for photos after the ride. 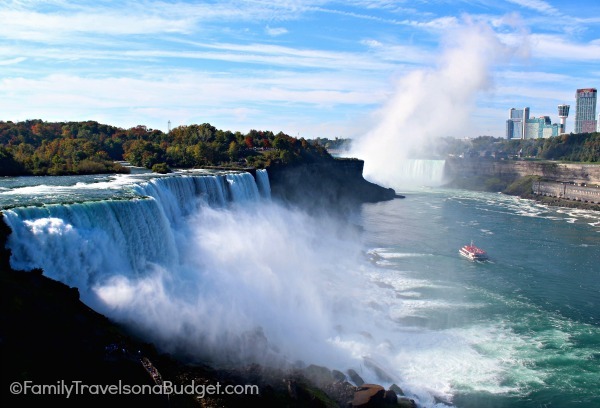 If staying in downtown Niagara Falls, consider walking to this attraction. It’s an easy walk on paved walkways. Otherwise, parking costs about $10/vehicle (2014). Address: 1 Prospect Street, Niagara Falls, NY. Click this link for driving directions. Maid of the Mist runs from Mid-May through the end of October each year and vary throughout the season. Check the Maid of the Mist website for hours during your visit. You can pre purchase tickets online or at the attraction. Current prices are $17/adults and $9.90/kids ages 6-12. Children under age 6 are free. Tickets for the Maid of the Mist attraction include access to the Observation Deck. Guests can purchase an Observation Deck only ticket for $1. The Maid of the Mist is also included on the Niagara Falls USA Discovery Pass. Current prices, which includes 5 attractions and one day of trolley use, are $36/adults and $29/kids 6-12. Children under age 6 are free. 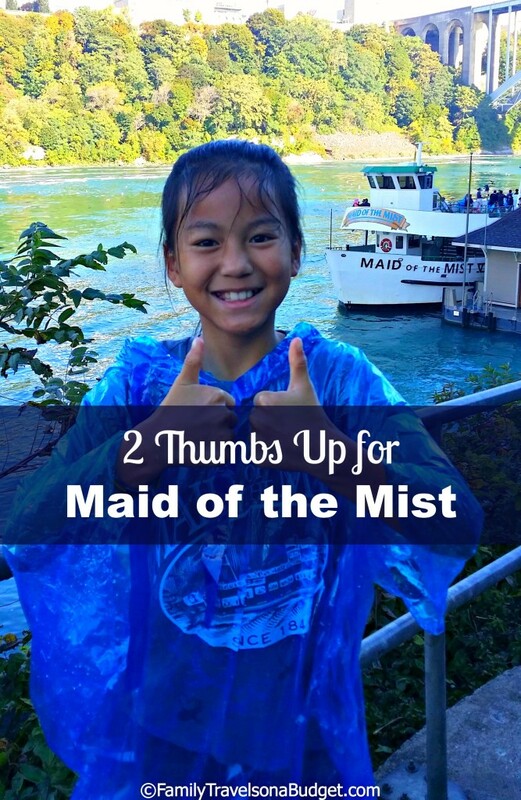 Have you ridden Maid of the Mist? Do you have any tips for us? We rode the Maid of the Mist last year for the first time and I expected a tacky, less-than the hype, type of attraction but we were actually thrilled with it. Getting that close to the water gave a perspective we couldn’t get from above. You make a good point about not being able to get good pictures. In addition to worrying about your phone or camera, it is hard to keep your head up with that amount of water streaming down. I also think the ponchos must be more of a marketing ploy than of real use because we were still soaked through!